It's tempting (if not inevitable) to start this review with an anecdote about that infamous E3 (which will be a decade ago by the time this year's event rolls around), and in particular, the oblivious flailing exploits of one Ravi the drummer. 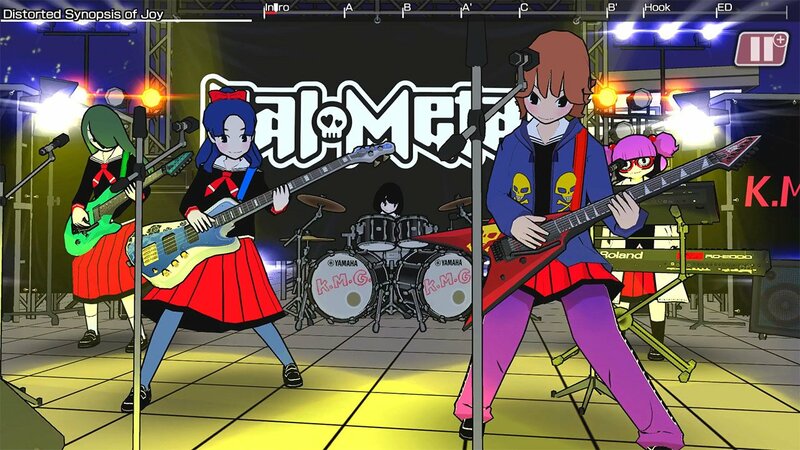 While maestro Tak Fujii's own meme-farming antics over the years live long in seasoned gamers memories, his newest project - the motion-controlled music game Gal Metal - deserves more than just a curious glance. The truth is, much time has passed and the stigma that comes with motion-controlled games is slowly and surely becoming less valid. The Wii had its moments of genius as well as ridicule, but for all intents and purposes, it was instrumental (pardon the pun) in the 'blue ocean' strategy to get every one and their dog playing video games. Even within its first year, the Nintendo Switch has shown time and again its universal appeal and versatility by having everything from first person juggernauts like DOOM and Wolfenstein II on board, to a series of cardboard construction kits to customise to your heart's desire. It is a pretty incredible machine, but memories that fateful E3 presentation and what could have been for motion-based music games still linger. 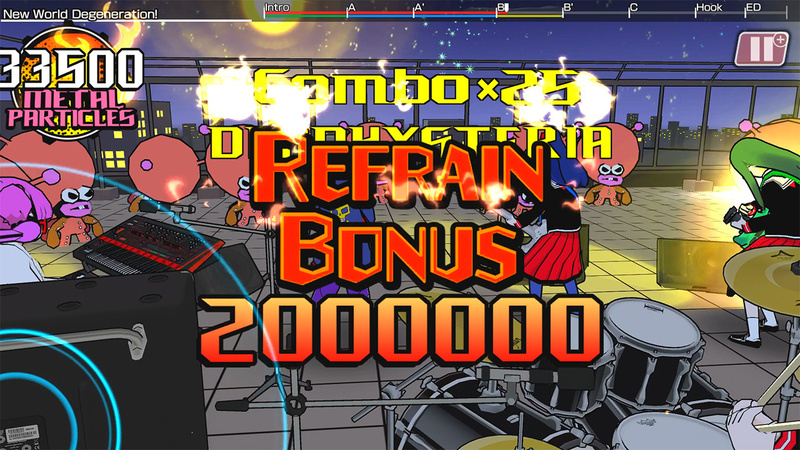 On the most basic level, Gal Metal is a game that allows you to detach the Joy-Con controllers to mimic a pair of drum sticks. 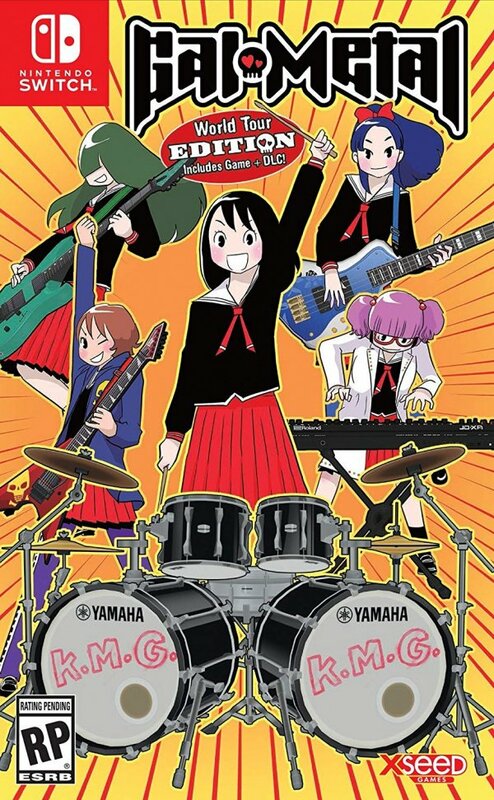 Other optional control schemes not withstanding (we will deal with them later), Gal Metal's other unique selling point is that it turns the 'traditional' music game formula on its head. Rather than employing a rigid, icon tapping or coloured button pressing method to measure musical proficiency or punish failure, there is a much more organic, creative and interpretive system at work here. There are three parallel stories going on throughout Gal Metal's 13 song campaign. Firstly, there's a slightly odd, gender-changing side story reminiscent of the hugely successful anime Your Name, and it serves as a light plot device to set up the main mechanic. You actually play as a boy that has been transferred into a girl's body, and as a separate entity, your female form helps you to socialise with your friends, work together with your band mates and play the drums. There are some predictably awkward moments and some visual gags that miss the mark, but it's whimsical, quaint and not hugely intrusive. Secondly, there is a narrative dealing with the lives and interactions of the different characters in the game, in the form of agonisingly long text message conversations. The 'contemporary' exchanges about social politics and incessant buzzing of your smart phone notifications explain the difficulties of juggling school life and managing a successful band. There are a few brief dialogue options to choose from, and some suitably wacky Japanese LINE emoticons thrown in for good measure, but overall if you aren't really bothered about the lengthy conversations (regardless of your Japanese reading ability - almost everything is in Kanji) it can become an arduous exercise in skipping to the end time after time. Finally, as if dealing with the pressures of adolescence and identity weren't enough, some gold records have been stored on a voyager satellite orbiting the Earth, but instead of classics like Chuck Berry, the record collection is made up exclusively of metal tunes. An unsuspecting group of octopus-like aliens experience this metal music and seek revenge on Earth for subjecting them to such head-banging nonsense. It is up to you and your band to thwart their invasion plans and convert them to true metal heads. 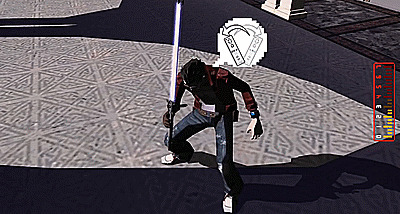 This part of the story is presented in a panelled comic book style, with sparse animations and extremely exaggerated expressions bringing a basic but functional and bold art style to the presentation. In addition, the gig introduction splash pages have a groovy red, white and black colour scheme which will please any Persona 5 fans out there. The third element of the story is where the gameplay loop starts. You’ll periodically enter into the “Metal Chatroom”, a simple, text-based social network used primarily to set up potential meeting places and skits to watch a little later on. The conversation topics are usually just about choosing option A or B and are typically whimsical in nature, such as choosing popcorn flavour, or whether visiting a coin laundry is fun. The process of siding with one bandmate or another, combined with the incessant buzzing of notifications becomes arduous, but thankfully are skippable. 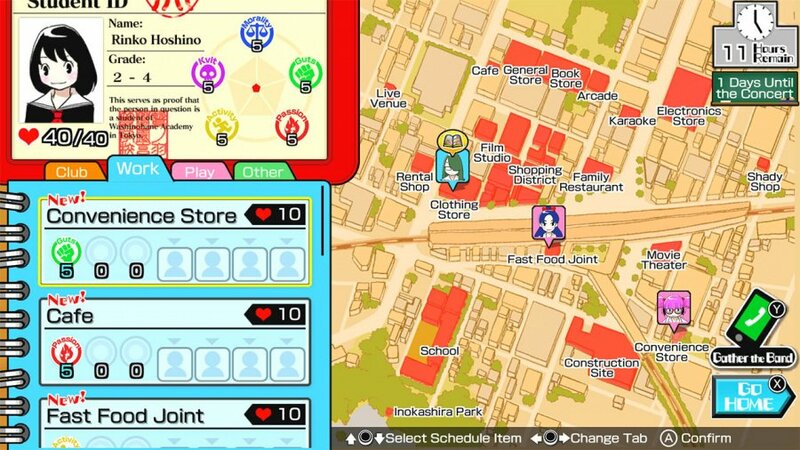 Outside of high school politics and octopus alien invasions, you'll spend your time going around various institutions in town, such as the convenience store, arcade and cafe. While the text is all in Japanese, it's reasonable straightforward to follow. In any given day, you'll have 40 hearts to exchange for different skill points, ranging from cult and passion, to moral and active. You'll use your notebook to choose various places, meet up with friends and build relationships. Once the days are gone and the yellow arrow appears in the bottom right of the screen, it's show time. You can also use your hearts to practice solo or as a group, learning new rhythms and familiarising yourself with the structure of the song for the upcoming concert. Rather than going for an almost gamified tutorial approach like Rocksmith, musically Gal Metal has a refreshingly open (and initially overwhelmingly esoteric) approach. The motion controls will feel primitive to begin with - think along the lines of 'left, right, together' of a Donkey Konga rather than the button-holding mess of Wii Music. There are two different control settings or “styles” of drumming - either the beat registers during the swing or when the motion stops, as well as a 20 point scale of sensitivity. Of course, any music game sinks or swims on its tracklist, and while Gal Metal's list of just 13 (plus an extra 5 if you get the DLC or physical version) heavy guitar versions of various classical compositions may initially seem difficult to digest, both the challenge and allure of the game becomes apparent. Crashing cymbals to the fourth movement of Antonín Dvorák's New World Symphony or adding a thrash-influenced thump to Friedrich Schiller's Ode An Die Freude are acts that are as bizarre as they are empowering, and the determined among you will revisit a song over and over, itching to strap the Joy-Cons back on and start rocking out again to try new combinations. Anecdotally, after replaying the same song five times, we found a real sense of progression and satisfaction, with enough desire to keep improving; there is a freedom offered in Gal Metal to accommodate your ability while providing enough incentive to develop. Getting the rhythm and timing down is only part of the puzzle, as the tracks have a basic chart at the top but no set drum pattern to follow, so you'll probably feel frustrated figuring out structure and what suits which song - whether it's a straightforward but fast-paced thrash style or a sparse stadium rock anthem moment. For the less musically inclined, Gal Metal will start off as a quite basic and monotonous trudge through unfamiliar (sometimes brief) tracks. The main campaign is pretty easy to breeze through, with the scores required paling in comparison to the astronomical free play targets, but it's listening to the songs structure and time signatures that will keep you coming back. Do the same beat over and over will only get you a limited number of points, but string together different and alternate rhythms while hitting those crescendos with crashing cymbals and your score will exponentially improve. During a gig, your 'Metalgon' score in the top left gives you an indication as to what's working and what isn't, multiplying and increasing as you go. Your final score is calculated based at the end of the song. 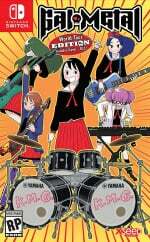 There are bonuses and achievement badges galore in Gal Metal, as points will increase dramatically based on your rhythm selection and variety, overall structure and a borderline mythical 'refrain' that can boost your score massively, making previously impossible targets suddenly become attainable. Rewarding your ambition and familiarity of the song rather than exclusively muscle memory, it's more like learning new moves in a fighting game or even a kind of musical Tony Hawk-style experience than something like Taiko Master. Drumming in Gal Metal is, on the whole, varied and very responsive, if a little inconsistent. It will take you plenty of tries to get into the swing of things, as it is initially a more disorientating experience than it should be. Those used to the more rigid scoring structure of music games may initially find Gal Metal to be dauntingly open to the point of almost being obtuse. We had a handful of instances where not holding the Joy-Con quite right would break a combo; even robotically repeating the same rhythm in order to find the 'sweet spot' wasn't as forgiving or reliable as we'd hoped when starting out. Once you get the motion controls down, there's a great amount of variety presented to you in the shape of a series of drop-down menus in your practice room. As an aside (and personally a minor annoyance), the directory of around 40 (some unlockable) rudiments to practice is only accessible from within the story mode. If you enter free play mode, you can immediately replay any song you have beaten in the main campaign with additional (and certainly daunting) challenge scores. Rudiments start from slow and standard timing to trademark grooves by genre legends Metallica, Iron Maiden, Judas Priest and Queen. Anyone that can perform fast and double bass heavy rhythms like 'Bloodstorm' on cue with the Joy-Con gets a lot of kudos from us, and as the speed and complexity increases, so too will your persistence. In addition, any beat can be 'inverted'; 'Harlot' for example, is a standard, single 4-4 beat on the bass drum, but it's also possible to do the same beat with the snare, further increasing your possibilities when it comes to gig time. While it is possible to get a stern, dark blue coloured 'fault' plastered across the practice room for one too many botched attempts at a bar length double time groove, the gigs themselves do have a score to reach, but it's up to you to balance variety, proficiency and astute understanding of a particular song's progression. This is where Gal Metal shines. Yes, it will take a great deal of patience and persistence for them to become familiar, but when everything falls into place and you get caught up in the motion-controlled moment, it is immensely satisfying. If you don't end up looking like a complete pillock, you're not having fun - as the saying goes, at least. The motion controls might seem limited, even primitive to begin with; think more along the lines of 'left, right, together' of Donkey Konga rather than the button holding mess of Wii Music, but as a neat addition before you've found your groove, there are other options. Unless you want to invest in one of these dashing cradles to play with motion controls on the go, Gal Metal thankfully supports both button inputs and touch control. Being able to unleash your inner beast on the commute without accidentally smacking someone in the head is actually a rather valuable inclusion. Using it to try out different combos is actually really useful, and the controls themselves feel a lot smoother than trying a new pattern out on the fly with the Joy-Con. There's also the nice inclusion of an overlay, and using both triggers alternately as a double kick drum feels tight when combined with the full kit mapped to shoulder and face buttons, all of which means you can generate a more fleshed-out sound. The touch screen controls are equally useful and responsive, especially considering there are no specific notes to hit or commands to follow. I thought it looked kinda interesting when I first saw it in the eShop, but at the end of the day I can't enjoy a game without an option to play in English. Ok gotta pick up an e-shop card. Sounds fun! Air drumming with joy cons, i'm sold. I was wishing for a review since you have been writing all kinds of news articles and features even though it is a Japan exclusive game. Thank you. At first I was really looking forwards to it but the price point made me a bit unsure. After reading the review, I'm worried I might not like it as much as I want to. I think I'll wait for sale and pick it up then. looks like something i'll enjoy. can't wait to get it at somepoint. "The Wii had its moments of genius..."
This sounds adorable. I'll definitely look into importing it sometime. i am probably getting the physical from amazon.co.jp … too weird and crazy to pass up. What some refer to as 'true heavy metal' is what happens when classical meets the early days of rock n roll. So heavy metal classical tunes make all of the sense. Anyone listen to Symphony X? Cue Tenacious Ds "The Metal "! This sounds exactly like I imagined. I'll definitely buy this one! I wonder if you get bonuses for weird polyrhythms that don't sound like they fit the tune until 42 measures in? I really want to try this, but I'm not sure if it's worth $50. I was perplexed by the existence of this review and even more so upon learning that you guys were issued a review copy. I suppose being such a niche game, the publisher will want all the sales it can get. The Japanese version of Spelunker Party (aka Minna de Waiwai! Spelunker) seemed straightforward enough (aided by the demo) so I ended up importing that, but I think the language barrier in this one would be too much of an impediment to enjoying the game (though a demo can help change my mind). I am familiar with Kana, but I haven't even begun to scratch the surface of Kanji yet. 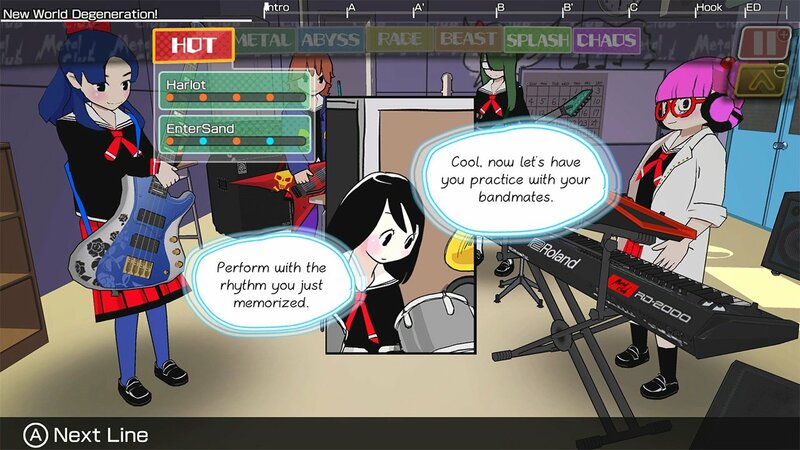 The game looks cute and all and reminds me a bit of K-On! but I don't particularly like playing rhythm games solo, nor do I like metal, so this is a pass. I will definitely consider importing Taiko no Tatsujin if that ever makes its way to Switch though. If an English translation is in the cards I'm sold! Glad this turned out well! Sounds so cool!! If only the art style was a bit more... mean!? @BenAV This deeply saddens me. Those aliens look just about ready to charge their lazers. How can we get this game? I really hope this game gets an english translation! This sounds like a fun game to pick up and rock out to! 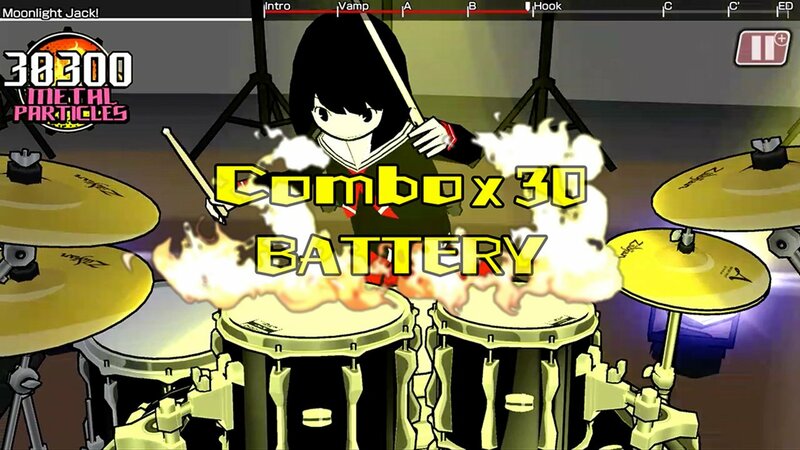 I haven't played a rhythm game in years, but if this gets an NA release, I'll be sure to pick it up! Pretty keen to give this a go now that it's been localised. My physical copy should hopefully arrive early next week. May want to provide a note that this is a republish. I was totally confused by all the mentions of Japanese-only text, yet screenshots with all English. It wasn’t until I checked comment timestamps that it clicked. I still prefer DrumMania than this game. Take a look the craziness from DrumMania songs. I bought this physically at the store last night, but haven't had the chance to play it yet. I did play the Japanese demo many months ago and loved the 60 fps visuals, fun metal/classical music, and strange gameplay. Anyways, I'm excited to jump into this game soon! I would be amazed if this not in the 19.99 after holidays sale. @Mew Haha all good. It's a little confusing how they just reposted their old review from the Japanese release. What a weird choice to simply repost an old review without any updating or disclaimers. It’s a good review made inaccurate by poor editing. I would be angry if I was the author of this review. Did they patch/improve the motion controls since the original japanese release? Tried the japanese demo and it was really fun, but the controls are sometimes a bit funky. @mateq : I made that comment 8 months ago. This is a bump of the original review, which was in reference to the Japanese release. This one actually looks kinda fun. Glad it made it to the west! I couldn't wait back in February (after reading this very review) and downloaded the Japanese version. Thought I was the coolest cat around for a few weeks there. Unfortunately, it had serious motion detection lag issues which made it impossible to play docked, and with so much of the game being unreadable anyway it landed on The Pile pretty quickly. From what I understand, they have tried to fix the first problem, and with this western release I was hoping against hope that it would essentially be an English patch update and all my dreams would have come true. But it wasn't to be - this is not recognised as the same game for some reason, so I'd have to buy it again. It is an incredibly cool game. But not that cool. @Silly_G There is an English version of this... I am playing it now... it is super wierd however they reviewed the Japanese version and not the English version. Oh yeah, this came out. I wasn't hugely impressed by the Japanese demo, but I still like the idea of the game. I'll need to check this out sometime. @Silly_G Ouch, somehow I was under impression that this is a new review and all the comments are therefore new as well... Sorry about digging up the old stuff! Just bought this from the eShop. I have a very limited sense of rhythm so this game might help improve it. I've got an old Akai drum machine lying about the house, just asking to be programmed with my unique beats. You guys just bumped a review of a different version and didn't update it?Or even bother to put a disclaimer at the top? Were the motion control issues addressed in the NA version? Any other changes? Why do we need to use another site to find an accurate review for the global version of this game? It didnt need a whole new review, but it did need some kind of update. This is just lazy. let me reiterate i am not being sarcastic or rude, but you have been coming here for how many years ??? Wait, there's real Metal songs in this game?